Do rooms in your home evolve over time? Mine too. Of course being a design blogger, means I am changing something every week. (Oddly enough, that works for me.) So here is another update on the dining room. I’ve added a new blue rug. I’ve also ordered a new table, but it isn’t here yet, but here’s the latest. I’ve recently added this lovely new rug. It’s from Ballard Designs. (Not a sponsored post, although I do work with them. ) I love a flat weave rug. I’m not sure why they appeal to me so much, but they do. This simple design is something I love. It gives the room some pattern, and color, without being overbearing. I want the food and conversation to be the stars in this room. I was surprised at how much of a difference it made in the room. I was hesitant to cover the lovely reclaimed oak floors, but this was totally worth it. You can see the before photo below. The photo below is before I added the curtains and the slipcovers for the chairs so it looks especially bare to me. 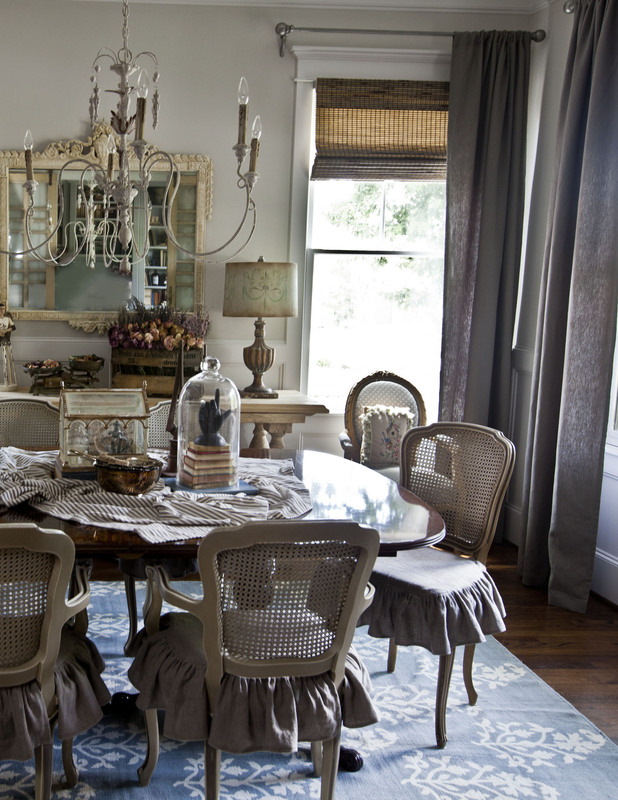 The gray linen curtains are also from Ballard Designs and you can read more about them HERE. Love that blue rug and just about anything from Ballard! 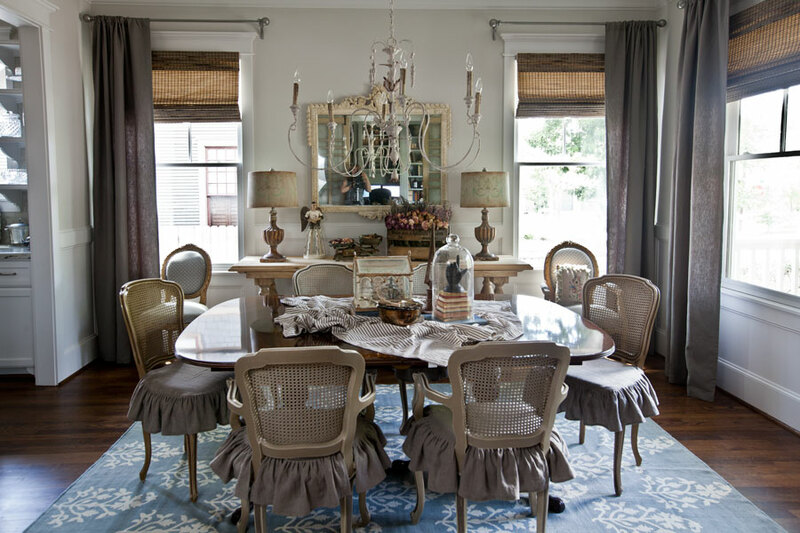 The colors of the curtains and the blue go together well; the ruffles add a feminine touch. I noticed the new rug in one of your previous posts but it’s great to see the entire thing now. I think it looks fabulous. I love gray & blue together and your choices came together great! I have said it before and will say it again, I love Ballard. The designs and quality is top notch. Just beautiful! Size and pattern scale make it look custom, and I love the color combo! You mean we are hot supposed t9mchange things up every week ? I’d go mad! Happy today Anita! I love this rug it really grounds the space. Thanks Anita for another beautiful room. The blue rug is a bonus to the room!!! The room is so much warmer now! Layering adds so much texture and interest to a room. I totally get wanting to wait a little while after moving in to let the room evolve though. I thought your table was a little small for the room, but with the rug, it looks more in scale now. Beautiful everything! I love those chair coverings! Love the blue rug. Love your blog. Look forward to it everyday. 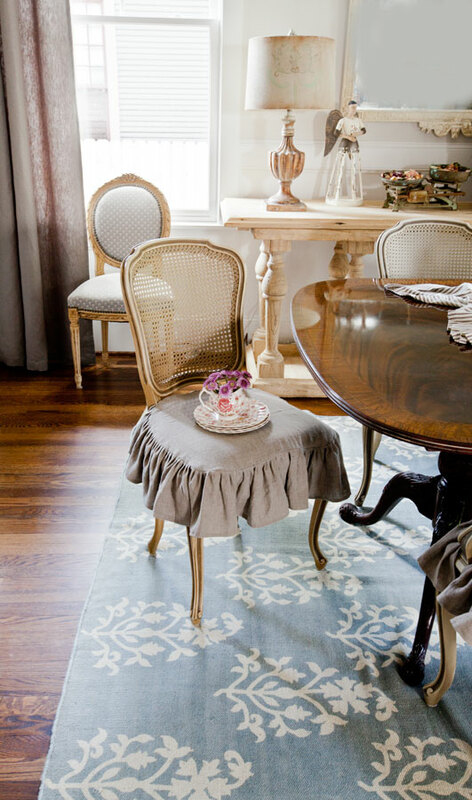 Love the soft pop of color the rug adds Anita and love those slips you made for your chairs!! I love your wood floors but I LOVE it more with the blue rug. I think it sets off the beauty of the wood much more than just leaving them plain. Great job! I really like that new rug! The dining room is simply beautiful. Always look forward to having my coffee and reading your blog. Thank you for the inspiration! Absolutely beautiful. It really finishes the room. It really gives the room a lift, beautiful colours and pattern. Ballard deliver to NZ now but not bigger items like this unfortunately. I too as a design blogger am always changing things around, it drives my husband nutty but there is so much inspiration out there and I spend so much time at home that I love to change things around and keep the home interesting. I too have been looking for that perfectly old looking rug for my front living room. One still muted in tone allowing each piece in the room to have a voice. Love the tone and so does not over power the room, again love your home both ways and love that you have the option to roll it up when you want the bare floor feel. I has such an European feel beating a flat weave, I am a big fan of this weave as well, in the same way I love those vintage Turkish rugs. What are you going to do with this dinning room one, and would a good sanding down and a lime waxed paint finish had pleased your look? I took an old 1967 African mahogany buffet and sanded it down much like the look on your dinning table and did just that to the buffet and cabinet that is in the last post of mine…to find out from Century Furniture Co. That the bottom half with paint grade finish I am looking at replacement of $3,800 if bought now from there show room. I only paid $22.00 for the bottom buffet and $30.00 for the cabinet and another $31.00 for wood to up style the cabinet with wood shelving and backing to it all and all for about $85.00 I have a prized piece. Sometimes the refinishing is so worth the savings. And the blend of older pieces to the new is so inspiring. Oh Anita, I LOVE the new rug and am so happy to see how much I like the blue with all the neutrals! I, too, have a very neutral dining room and never thought I could use a rug with color. So, thank you!!! I have wanted a new rug for awhile so am now going to look for one. Your dining room is GORGEOUS, the rug really finished it. Can’t wait to see the table!!! Aww that sounds interesting Cheryl. Which book? I, too, l o v e Ballard Designs, dear friend!!! The rug adds another layer of softness to the hard edges in the room. While the floors are g o r g e o u s. . .I adore the addition of the rug!!! I am admiring your lovely draperies!!! 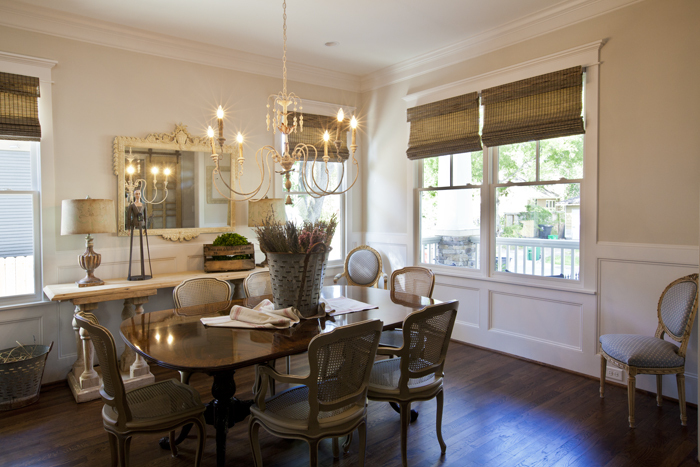 I love the transformation your Dining Room is taking. The addition of soft draping fabric atop the table has me swooning!!! Anita, I love your new rug and it looks perfect in your beautiful dining room. Hi Anita, Love your dinning room! I would like to know where you bought the chair covers! I love them, they just make the room! I make my own, because I have never found any I liked for sale. Could you please show me how to make them?